Way, way back when… actually, even further back to when I was a junior in high school, I thought I was in love with an Indian boy. That relationship is one big complicated story best told over a beer (or three), but the short of it is that, 2.5 years later when the relationship finally untangled itself during my freshman year of college (and I realized I was, in fact, not in love with said Indian boy), I was officially in love with Indian culture. It turned out that I had picked the perfect college for my interest in Indian culture and tendency to crush on Indian guys — Austin College had an Indian student population so big that the Indian Cultural Association (ICA) was actually the largest student organization on campus. I managed to convince a friend to attend an ICA meeting with me as a freshman and once I knew they weren’t going to kick me out for my whiteness, I was hooked. I regularly attended ICA meetings and events, and went on to become the first (and probably only) white officer of the group. (If only I could find a photo but, alas, that was in my predigital camera days and I can only crawl so far into the attic right now). Over the course of my college career, I learned tons more about Hindu holidays, Indian history, and fell even more in love with the food and traditions. I borrowed saris and salwar kameez for festivals, lit diyas at Diwali, threw colored powder at Holi, watched Indian movies, listened to Indian music, learned to cook Indian food and even tried fasting for Ramadan for a couple of years. Chris shares my love for the fragrant comfort of Indian food, so after we got married we continued to celebrate Diwali, inviting all of our friends over to eat piles upon piles of curries and koftas and paner every fall. 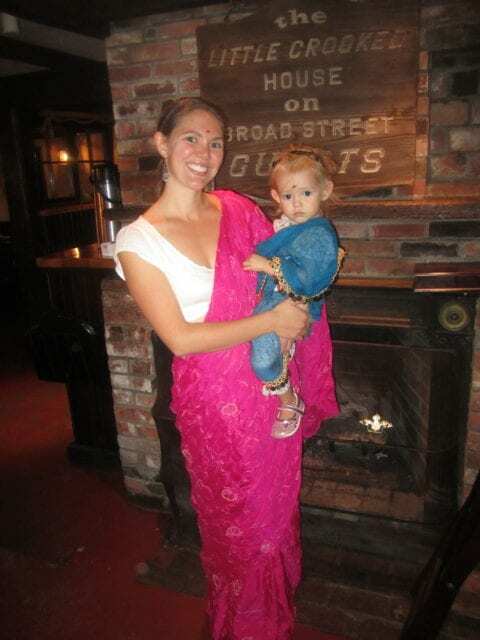 Things got a little trickier after we moved out to Nantucket and Chris started having to work, but two years ago, I tried my hand at balancing a baby with cooking, cleaning, and party hosting on my own. To say it was a little stressful would be a giant understatement, so last year I skipped all of it and just invited my friends to join me for Chris’ Diwali dinner at The Brotherhood. It was delicious but it wasn’t quite the same and it wasn’t as kid friendly as a party at the house, so this year I went back to hosting at home and I am so, so glad that I did. The kids had a blast, from helping to roll out naan to destroying Nora’s room (as only kids can do), and we grown ups stuffed ourselves silly with all sorts of delicious and decadent things while hanging out and chatting for nearly four hours. It was chaos, but controlled, and not quite as bad as two years ago — there were no dishes hiding in the bathtub this year — and it was completely worth the effort. Today is actual Diwali and Nora I celebrated again at home, talking about Lord Rama and the triumph of light over darkness, and eating Indian food for the fourth day in a row. Chris and I decided a long time ago that we want Diwali to be part of Nora’s holiday memories and I’m so thankful that we have friends willing to help us make the holiday stand out for her, even if they’ve never heard of it before. Awww. this is so sweet….